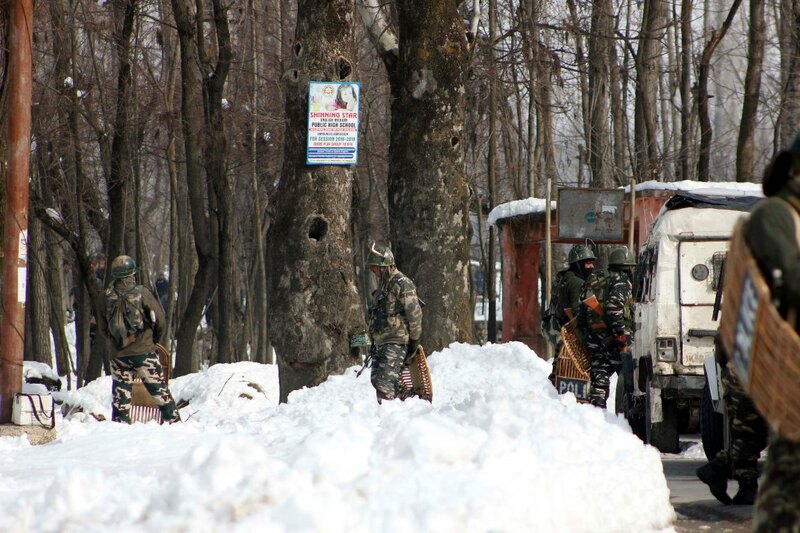 A day after the weather gods send eight coffins to the graveyards from the avalanche site near the Jawahar Tunnel, a counter-insurgency operation in Kelam – falling in the same Kulgam district, led dispatch of five more coffins – this time militants. The early morning encounter led to the destruction of the house in which the militants had taken shelter. Official sources said the operation was mounted within minutes after they received “credible inputs” about the presence of a group of militants in Kelam village. 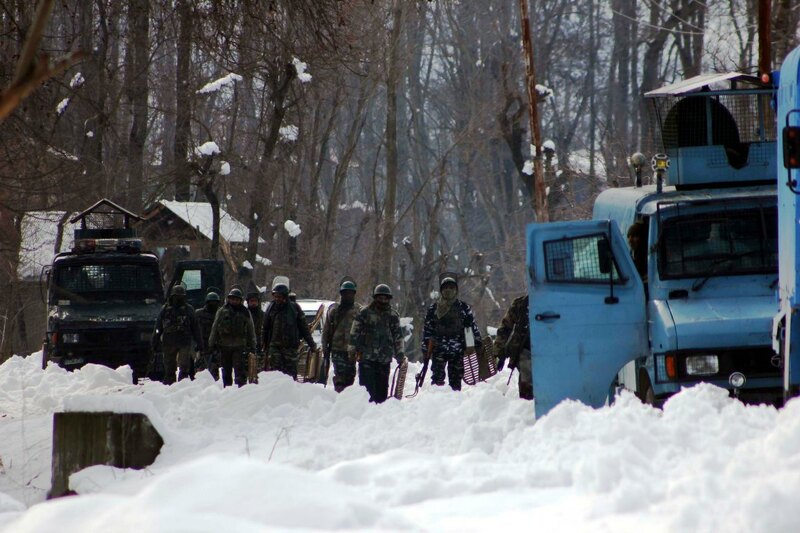 Part of Devsar assembly segment and Kulgam district, the counter-insurgent posse was mixed comprising Army, CRPF and the Special Operations Group (SOG) of the state police. The cordon was enforced during the later part of the night after the specific cluster was “properly identified”. After the presence of militants was confirmed, police started evacuating the civilians from their homes. By the first light, the militants were asked to surrender. They were asked that their life would be saved because they are all locals. They refused to surrender and instead resorted to heavy gunfire. In retaliation, four militants were killed in the first go and later one survivor was also killed. In the ensuing encounter, the house was completely destroyed, especially the first floor and part of the ground floor. The police said they used a range of smaller weapons in which the house was also seriously damaged. “By around 2:30 pm, exactly 12 hours later, the operation was called off,” the sources said. However, as the operation started, people from different sides started reaching near the encounter site. They did engage the outer cordon of the operation. Police said they used tear smoke shells and the shotguns in which almost half a dozen protesters were injured. One of the injured was referred to Srinagar, they said. Police said four CRPF personnel and a few cops were also injured in the clashes. 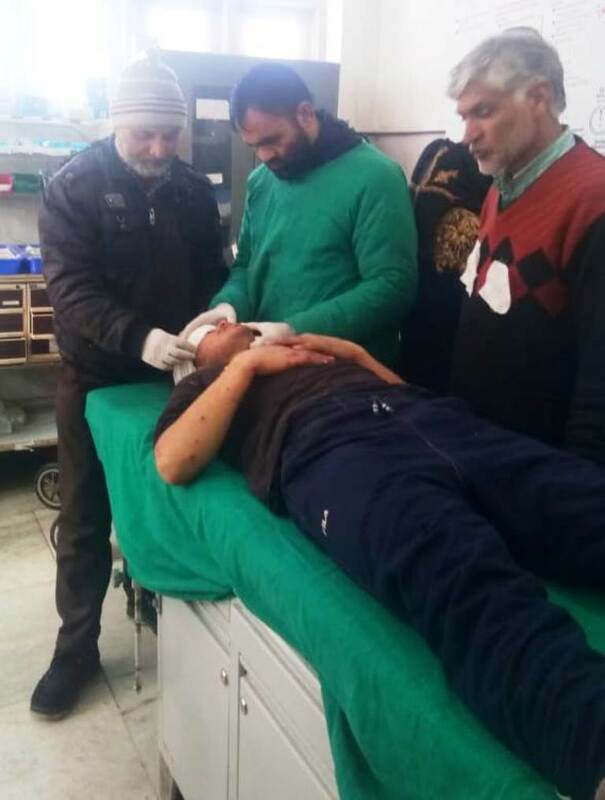 “One CRPF man and one cop were referred to Srinagar for treatment,” they said. Police issued two statements during the day. The last one gave more details. It identified the slain five as Waseem Ahmad Rather son of Bashir Ahmad Rather (Ashmuji Kulgam), Aqib Nazir Mir son of Nazir Ahmad (Zangulpora, Devsar), Parvaiz Ahmad Bhat son of Bashir Ahmad (Mukdam Mohalla Qaimoh), Idrees Ahmad Bhat son of Ramzan Bhat (Arwani) and Zahid Ahmad Parray son of Abdul Hamid (Gopalpora in Damhal Hanjipora). Waseem, Aqib and Parvaiz were involved in the killings of a civilian Mohammad Iqbal Kawaq, a resident of Kilam and local army personnel Mukhtar Ahmad son of Ghulam Hassan Malik, a resident of Shurat, for which cases stand registered in concerned Police Stations. 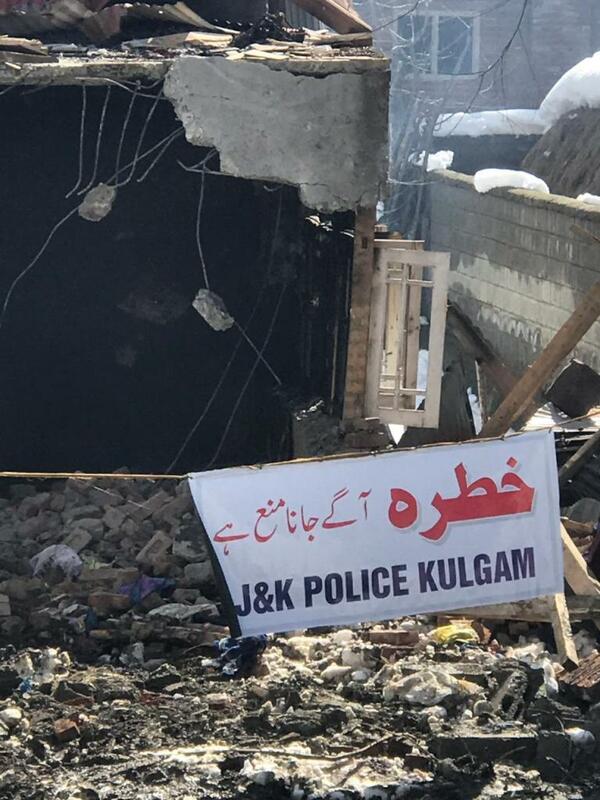 Police prevented the locals from getting into the exact spot of encounter fearing the unexploded material may create problems. It had put warnings around the spot to prevent people’s access to the spot. The district lost a number of civilians in a village where some landmines went off after the encounter. However, after the operation was called off and police moved out of the area, residents in hundreds came and visited the damaged house. An adjoining house was also damaged. Police later used earth remover to scan the rubble. SSP Kulgam Harmeet Singh said they did recover five weapons from the spot of the encounter that lasts more than six hours. “We tried our level best to make them surrender but they refused,” he insisted. The encounter disrupted the routine movement in the belt. Authorities even stopped the train services to the region. The internet services were closed for the day. Reports from the region said that one of the slain militants Waseem, a resident of Ashmuji had completed his MPhil and had registered or was in the process of registration for PhD when he joined militancy in May 2018. Son of a forest employee, Waseem had done his post graduation from in English from Barkatullah University and later did his MPhil, also from outside the state. He was perusing his PhD. Residents said Waseem was a social activist and highly religious that led the counter-insurgent network to get him in their radar. He was frequently summoned and beaten at the local garrison. In 2016, one resident said, he had his limb and arm broken in the same camp, allegedly in torture. Later, he joined militancy. Youngest of the three brothers, his one brother, Shabir, was serving police and he took voluntary retirement after Waseem joined militancy. His other brother sells books. Within hours after the body was handed over to the family, thousands of people offered him funeral prayers and he was laid to rest as hundreds of cell phones recorded the event that took place in the local stadium. One of his brothers led his funeral prayers, reports said. Ashmuji is the same village, a resident of which, Nazir Ahmad Wani was given Ashok Chakra, posthumously. Wani, a recruit of 162 Territorial Army was deployed with 34 RR and was killed in an encounter in Shopian. Reports said the funerals of the remaining four slain militants would take place on Monday, the anniversary of Maqbool Bhat. Kashmir is expected to observe a strike on the separatist call on Bhat’s anniversary. Reports said that some news-photographers who had gone to cover the incident were roughed up by some people who accused them of being the “agents” of the police. One of them was pushed into a stream forcing him to return without covering the incident.